I thought I’d share with you how I served the Roasted Leg of Lamb with Turnips, Potatoes, and Red Wine Gravy. If you’ve got entertaining ahead of you (and I’m sure many of you do as the holiday season approaches), this is a complete dinner that elegantly feeds a crowd. You’ll look restaurant-ready without having to pull off restaurant-style hours to get this menu together. I served the lamb on a puree of carnival squash (the more common acorn squash would do just fine as a substitute). The sweet, fragrant taste and luscious, velvet texture of the squash puree proved a perfect complement to the full flavored lamb and gravy. I rounded out the dish with my Roasted Brussels Sprouts with Pomegranate. Although these side recipes serve six, with all the other sides on the plate there is plenty to feed a larger crowd. For dessert, I suggest my German Apple Tart and a nice bottle of Sauternes. You’ll have happy guests indeed. Preheat the oven to 400°F. Line a rimmed baking tray with aluminum foil. In a small bowl, combine the oil, sugar, and ras el hanout. Place the squash halves, cut-side up, on the baking tray and pour the flavored oil over both halves. Use your hands to rub the oil all over the squash flesh. Bake for 50 minutes, until very tender. In a medium saucepan over low heat, warm the cream, stock, and salt. Do not bring to a boil. Pour into the bowl of a food processor. Scoop the squash flesh out of its skin and add to the warmed cream mixture in the food processor. Process until smooth and creamy. Adjust the salt to taste. Note: Ras el hanout is a Morroccan spice blend of cinnamon, cumin, peppers, and turmeric. Although it sounds super exotic, it’s actually readily available. Most supermarkets should carry it since it is available through McCormick spices. 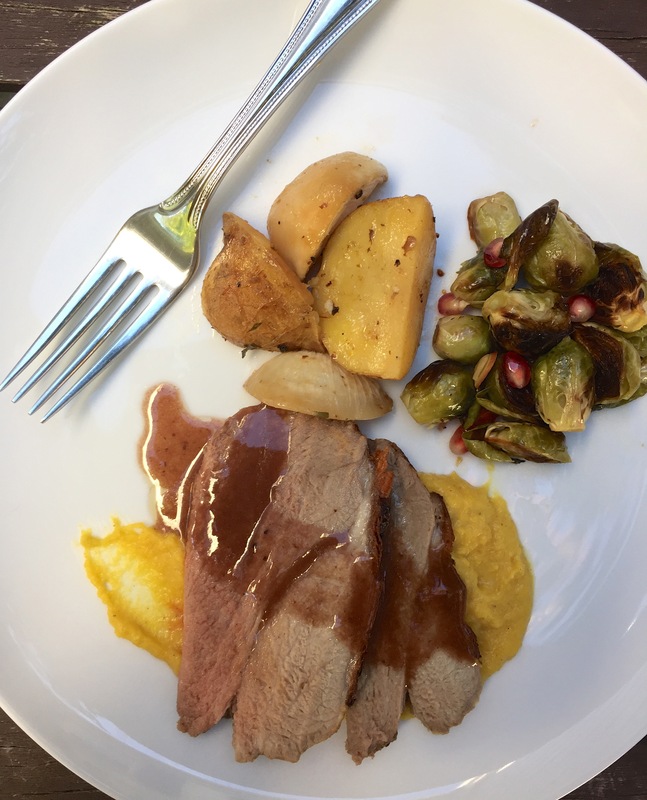 This entry was posted in main, side and tagged cooking for a crowd, dinner party, dinner party menu, fall dinner, lamb, puree, roast, squash. Bookmark the permalink.